In The Last Jedi, Yoda looked very puppet-like and you could tell they took great care to make him look like what we all remember from ESB/ROTJ rather than the CGI version from the prequels. But with the CGI aura and transparency done after-the-fact, I wasn't sure if the body itself was done with a physical prop. Did they actually use a puppet or did they digitally recreate Yoda to look like the old puppet? Not only was it a puppet, but they even got the original voice-actor/puppeteer Frank Oz to provide the voice and operate the puppet. And if you were wondering, yes, it is Frank Oz puppeteering the whole scene, reuniting the cinema veteran with Mark Hamill decades after they first appeared onscreen together. “Frank came back, and Frank puppeteered and performed the entire thing,” Johnson said. “The whole thing is a practical performance by Frank. ILM sent a giant crate filled with nearly 40 years of material, a time capsule that doubled as a treasure chest for Scanlan. "As we opened the boxes, it was cleary evident that each model we took out was from a more recent model," he recalled. 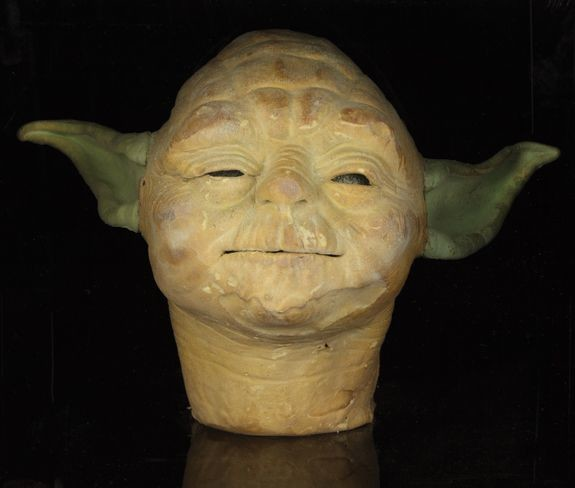 "Then we got to the very bottom, and there was this wooden box and I could tell instantly that that was an original Yoda mold that Stuart Freeborn made. "As we undid it, there was the original head of Yoda," Scanlan added. "That and one hand were the only two things that we had to go on." Scanlan and his team supplemented those building blocks and schematics with second-hand research that included conversations with old ILM employees and puppeteers, as well as studying video they found on the internet. They also had the luxury of conferring with Oz himself. One of Scanlan's first big professional jobs was on the Oz-directed big screen adaptation of The Little Shop of Horrors, and they knew each other from the Henson Creature Workshop, where Scanlan was a founding member. "He was one of my idols and to have worked with him then, he couldn't walk away from it," Scanlan said, laughing. "There was too much enthusiasm from our department. I think he would have never been able to live with himself." As much as they wanted to recreate Oz's original Yoda puppet, the creature team didn't shy away from utilizing small advancements to assist in the performance. "We wanted to make the technology a little more reliable and a little bit more user-friendly," he said, "but knowing that Frank was going to perform it, we just wanted him to feel that he was engaging with this puppet in a way that was completely and utterly intimate to him. That's what puppetry is all about: the ability to portray and convey the emotions of the puppeteer behind it, you know? No greater puppet than Yoda and Frank Oz." Not the answer you're looking for? Browse other questions tagged star-wars the-last-jedi yoda cgi or ask your own question. What goes into the design of lightsaber hilts? Is there an explanation for why Yoda's grammar slips in Empire Strikes Back? Is Luke violating the ways of the Jedi in The Force Awakens? Why did Imperial Star Destroyers change? In Star Wars, does Yoda become more or less powerful with age? Was this actually this characters plan in the Last Jedi?